Beverly Ramos was our guest on Episode 59. C259: I am thrilled to introduce our latest guest on our show, and it’s amazing that she’s even able to join us. 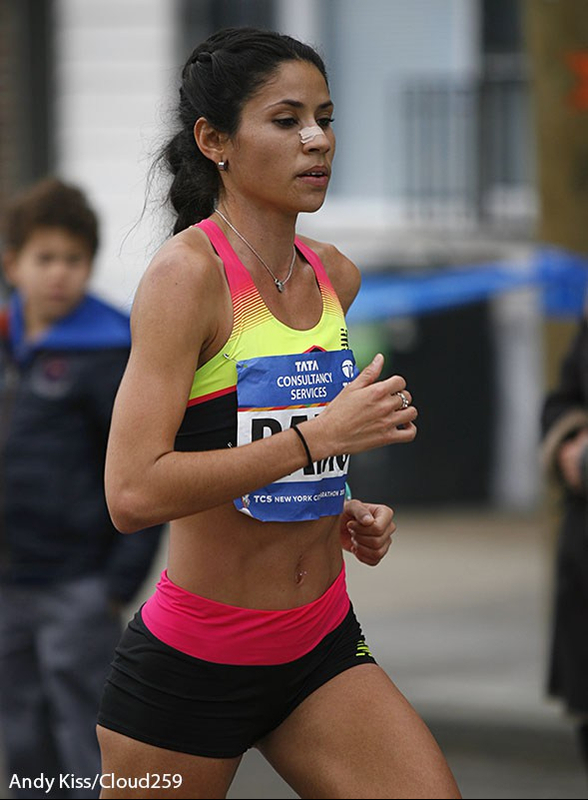 Beverly Ramos is an Olympian, an elite runner from Puerto Rico, training right now in Puerto Rico for the NYC Marathon in a couple of weeks. Beverly is Puerto Rico’s record holder in, get this, the 1500m, the 3000m, the 5000m, the 10,000m, the 10k road race, the 15k, 20k, half-marathon, marathon, and the steeplechase. Did I miss anything, Beverly? Beverly: I guess only the 3k and 5k indoors, I did in college. C259: Indoors and outdoors in both of those, that’s amazing. Welcome to Cloud259. Beverly: Thank you for the invitation and reaching out all the way from London. I really appreciate it. C259: It’s great to have you. First off I’d like to hear about your experience during and right after Hurricane Maria roared through Puerto Rico September 20. What were those days like? Beverly: Well I remember calling my coach right before the hurricane hit. Like you said, I was in the middle of training for the TCS NYC Marathon. I called my coach and said hey can I do my workout before the hurricane hit. It was going to cross the island, basically. We are only 100 miles wide. I did that, and then I went home with my mom. I stayed because she was alone. We never had this kind of hurricane in Puerto Rico. It was the first time. We got two category 5 hurricanes in one month. It was unbelievable. We had Irma in the beginning of September, and then Maria, but obviously the worst came with Hurricane Maria on September 20. C259: The devastation must be incredible. When you are on your runs training now, what kinds of images are you seeing? Beverly: Horrifying, if I had to choose one word I guess. Our country is very beautiful and green. The nature that we had, because we don’t anymore–blue oceans and so many trees, palm trees and all that, it’s gone. Now what you see is a horror movie. The leaves are gone. Now our trees are recovering, but at the beginning, when I went for my run, 24 hours after, because I couldn’t travel to New York — I was supposed to run the 10 miles in the Bronx and I couldn’t make it — so I decided to continue training for the marathon. I was in tears, the first 30 minutes, just seeing all the streets, all the cables, everything was down on the ground. You realize this is your home and it’s not what it was, 24 hours after. It was very, very sad and depressing at some point. You think things are not going back to normal and that you lost everything, but the people are so much stronger than before. Hopefully this will help us, everyone, to get back to maybe a better country than what we were. C259: It’s going to take a long time, I’m sure. In the month or so since the hurricane, is it getting better, or getting worse? My assumption is that when you lose the power grid, things continue to get harder and harder. Beverly: Yes. And people are getting sick, because the water is contaminated. We were about two weeks with no water. Right now we have no power. Only about 15% of the country has power. We are running the country, and businesses, and hospitals, the airport — everything is running on generators, and that contaminates everything. We are breathing all these chemicals, and we don’t have trees. This country is very, very hot. We are tropical, the average temperature is about 80 degrees, very high humidity, so it is becoming a little extreme to just live day by day. They are trying to recover and restore power as soon as they can. At first they talk about six months without power, and I said to myself my God this is going to be extremely hard for everyone to survive, you know. Then they started to work a little bit faster. We got a lot of help from the U.S. and other countries, including Europe, South America, Canada. Thanks to God, I guess we started getting back on track. There are so many people right now that have nothing. They lost their home or houses because of the hurricane, or worse they lost their jobs so they can’t put food at their home. There are so many things that you don’t think will influence, you know, the problem. Like everyone says, the hurricane is not the natural disaster, it’s what comes after that that makes it very, very difficult. C259: You must be under such emotional and physical stress. How are you able to maintain training? You must be helping out so many people. What has your training been like? Have you been devoting so much energy helping out others or getting supplies? Tell us about your typical day, I guess there is no typical day, but what has it been like for you? Beverly: There have been very special days, that I have to say. In training, socially, emotionally, even health. I’ve had days where I just feel terrible. I had pink eye at some point, conjunctivitis, that became an epidemic. At first I thought I couldn’t make it, I couldn’t do it. I couldn’t sleep for about seven days. I only got one or two hours of sleep, and that was the first red flag for me. I thought oh my God I was under so much stress. Then I made some phone calls. I was able to reach New York Road Runners. Obviously, they were following what was going on in the country, but I wanted to be responsible for my preparations towards the marathon. They gave me so much support, and that was the first step for me to decide that I needed to continue, not just for me, but for the people that are following my career, for the people in the country, for so many kids that are thinking maybe the worst, that things are not going to get better. I thought it’s not going to be easy, and it’s not an ideal situation. I decided not to leave the country and do the rest of my training here. I needed to help people and to help my mom and my family and my sisters. I have all my family here, in Puerto Rico. I just said to myself I’m going to do it. I’m going to do it here. It’s going to be very hard, the hardest training I’ve ever done, under the hardest situation, but I know it is going to be an inspiration for so many people, and those stories are going to become very important in the following months. The things that we do as a country, and that we set out to do, are going to become extremely important. We cannot show to our generations that we are weak. We have to show that together we can stand up and work and fight to restore and recover and be once again a greater island and a greater country. C259: That’s very powerful. That was my next question. I was imagining that you could have left the island at some point and trained where you went to school in Kansas or close to your coach Mike Smith. Beverly: Yeah, Mike suggested that, New York Road Runners also made an offer, and New Balance my sponsor also made an offer, and I am so thankful that they did, but it was a very, very personal decision to stay. I think it is a more powerful story if I do it this way. It is not going to be about personal gain, it is going to be about trying to make an impact in everyone, to make people believe that we can do whatever we set out to do. It was not going to be the same if I left Puerto Rico and started training in ideal conditions or with power and food and all the commodities that we normally have. To do it under these circumstances, people are going to start to believe, she did it, and she did it the hard way, so they all can do it. That’s the message I want to send to everyone. C259: So Beverly, as more and more people listen to your message and as we get closer to the NYC Marathon you will become a bigger and bigger story. What is the best way for runners to get involved, or anybody to get involved? Is there anything running related, our listeners might be able to think about to help Puerto Rico? Beverly: Yeah, right now, sports are not important in the island, because resources are very limited and they are trying to spend those resources to save lives and trying to bring all the things we need to survive. If you are out there listening to this interview and you would like to do some kind of donation. It does not have to be money. It could be equipment or anything. Our tracks are destroyed, so right now kids are going to have a very hard time doing the sport they love. And not just tracks, basketball courts, tennis courts, anything you can imagine got some kind of damage, at least. So I just want to tell the world that hey, if you want to do something, and help Puerto Rico, don’t be afraid to reach out. Hopefully by the end of the year, if things continue to go better, I’ll probably do a track camp, and I’m going to try to get as much people as I can involved, and try to get these kids moving again, helping to give people a healthy lifestyle and something to do. Right now, we don’t even have TVs, so it is going to be very, very hard for people to have this new reality where we have to get gas to have a generator, and get food, clean water. We try to find clean water. Lines are six, eight hours for every single thing. There are no movies, no nothing. All of those things that we enjoy, there is none, so we have to start again. So I think what I do as a professional runner, right now is even more important to go out to the community and help them do something, so they have this one hour of relaxing and forgetting about what just happened. Maybe, maybe that way they are going to have maybe a better day, a better week, maybe a new inspiration to keep fighting all the things that are going on. C259: So at the same time, with all this going on, at some point you have to focus on your training. You are running the New York Marathon, you want to do very well. How is your training compared with all of the barriers to getting the work in? Have you been able to run as much, and as well as you have in past marathon cycles? Beverly: Some days were terrible, I won’t deny that. Some days have been great. Like I said, this was the moment to work together. I reached out to a couple of training partners. I said hey, I’m going to do this and I want to do it here. They committed to this and helped me out. Some days I needed a lot of help. That made it a lot easier, to have people believe in what I’m doing and to cheer me on and to help me out. It was not easy the first two weeks because of communication. I couldn’t reach them until two weeks after. Those first two weeks were very, very hard. But after that we started to have a bit more communication in the country, and more gas. That was a very big challenge. We were running out of gas. I was trying to save it because I didn’t know how long it was going to last, so I started training from my house every day. If I needed to do a harder session, I would just bike to a flatter course. I had to change training hours because we have no power, so I had to either start at 6 in the morning because 5/5:30 was too dark, and like I said, no power, or go around 3 or 4 o’clock so I would finish before sundown. That made it hard, because you are pretty much running with the sun, all the time, 80, 90 degrees. You get used to perfect conditions and getting your sleep and getting great food. I ate canned food for three weeks, basically sausages, SPAM with rice, canned beans, nothing fresh, no veggies, no fruits, because we didn’t have a refrigerator. You start getting stressed out, because you know those are all the red flags for a marathoner. You need to eat well, you need to get better sleep and take care of yourself. I was like, you know what, I’m going to try to do the best that I can. I know the day of the race I will understand that I went through something a lot harder than just running 42 kilometers. I think that’s going to be the best race and it’s going to be the best experience of my life, comparing what’s been the last month. C259: You’ll certainly be ready for anything after all you’ve been through, that’s absolutely true. Beverly: Yeah, definitely. and I didn’t want to run away from it. This will definitely make me a better person and understand that we have to help, we have to help everyone. Sometimes you take a lot of things for granted, and then you realize, oh my God, yeah, I had everything, pretty much. Then when you have limited resources, you really really start appreciating, especially power! For me, right now, that is like a million dollars in my pocket. If I get power back, any time soon, that will be like a million dollars in my pocket. C259: Do you have a generator? Beverly: We don’t. I sleep pretty much sweating in my bed. We don’t have a generator. That was another thing that became sparse. Very few people where I live have generators. I know there are a lot coming, but I don’t know when. We didn’t get a generator before the hurricane. Maybe I’ll get one when I come to New York. That’ll be a good investment, to bring it here. C259: And you are how far from San Juan? Beverly: Only ten minutes, south bound from San Juan. C259: Is it Alto Trujillo. C259: Trujillo Alto, thank you. And you mentioned nutrition. I didn’t realize the impact it has on nutrition. You are eating canned beans, it’s unbelievable. C259: With all this, can we talk about what your time goals are for New York? You ran a personal best of 2:36 in Dusseldorf in 2016. Beverly: That’s my goal. I want to run faster than that, in these conditions. I’m going to be the happiest runner out there. If I do that, it’s going to be the fastest time for a Puerto Rican, under the hardest conditions possible for training. I’m want to have a really strong goal, going into the race. To do your personal best takes your best day, most of the time. But I guess the mental factor is a strong component on race day. I have this big motivation to do something great on that day. I think people are going to be very pleased and very happy if I am able to do a national record. That will be just amazing. C259: Breaking your own national record, of course, but that would be amazing. That would be five minutes faster than your New York [in 2014] when you ran 2:41. Very even splits, I might add, you were 1:20 and 1:21 in that race, so are you planning to go out pretty much even splits. Beverly: I’m planning to go out a lot quicker than that year. That was my debut, and I was very scared. Now I think I’m ready to go out faster. I’ve done faster splits in training here in Puerto Rico. I’ve done 1:16/1:17, so I feel comfortable with those, especially in the heat. On race day it’s going to feel a lot easier if the conditions are a lot cooler than here. It’s going to be 40 degrees cooler than Puerto Rico. That is going to help me out a lot. That will help me in the later stages of the marathon. C259: I’ll tell you what else is going to help you in the later stages is the large Puerto Rican population in New York, especially in the Bronx. Beverly: Oh yeah. It’s becoming a local story. I’m trying to do a lot of media so it gets out there. I’ve cried, I get emotional, but I want people to know what’s going on and that they don’t forget that we are not recovered, things are not normal here, we still need a lot of help. If I am a vehicle to reach out to people on that day I will definitely do it, especially on marathon weekend where there is going to be a lot of media coverage. I’m trying to do as many interviews as possible and try to get people involved with what is going on here. C259: Look, it’s an amazing, amazing story, and you should have every media organization after you. I just hope you don’t get too exhausted. Beverly: Yes, I know I know. I will try to be calm two days before the marathon. I will try to just relax in the hotel. I think I get there Tuesday, and then do two days of things, and then I’m just going to rest. I’m trying to do things before I get to New York so I can really enjoy that marathon week, obviously it’s going to be like an oasis for me. Having power back again and being in a hotel, that is going to be very nice. I’m really looking forward to it, but in the meantime, if I can impact just a little bit more, than my work is going to be done. C259: I’m sure, you’ll have millions of people — you’ll have anybody with a generator in Puerto Rico following you, and you’ll have a large portion if not all of New York. Beverly: Yes, I really hope so. C259: We won’t keep you longer. We do have one question we ask all of our elite guests. It’s really about training, so any training insight you have to help any of our listeners run a personal best in the marathon. Our listeners tend to be dedicated runners, they’ve been putting in the miles. But whether they are looking for a sub-3, or a Boston qualifier, or a sub-4, what is a secret recipe you can share with us? Beverly: One of the things that a lot of people forget is that the marathon is very, very long. Even though you put a good amount of mileage, you still have to do quality workouts that are long enough. Don’t get stuck with intervals, because like I said the marathon is very, very long. I find it very helpful when I do long fartleks, like an hour and a half workouts. I alternate 10k pace, then marathon pace, then easy pace, for an hour and a half. That is one of the workouts that really helped me out on race day. During that workout, practice hydration every five kilometers, pretty much. For elite runners, usually we have water stations or tables every five kilometers, so that’s what I normally try to practice in training, having my drinks every five kilometers during the really hard workout, because it’s not the same going easy pace. C259: Yeah, when you are running really hard it can slosh around in your stomach, it can make you a little sick. So when you say a fartlek, that would be alternating, how long are the intervals in the fartlek? Beverly: The 10k portion is two or three minutes, at that pace. The longest portion is the marathon pace segment. I start at four, and then when I get to pre-competition phase, I get to six minutes at marathon pace, and then the easy or recovery portion is about three minutes, and then you start again. So 3-4 for 10k pace, 4-6 for marathon pace, then 3 minutes or 4 minutes for easy pace. So pretty much the first and the last segments are very similar, but the longest we always do at marathon pace, and that’s pretty much the middle. C259: That’s quite a workout, a true marathon workout. Beverly: Yeah. Long, and you hit the specific paces, and you do a recovery. It allows you to hydrate very well, and quality miles, definitely. C259: Beverly, thank you for that, and thank you for telling your story over the last month and what you’ve been doing. It’s just incredible. We’ll be all rooting for you, tremendously. C259: I think you are going to be a big, big story and are going to do a lot of good for the island. Beverly: Great. I really appreciate everything, and I can’t wait for New York!